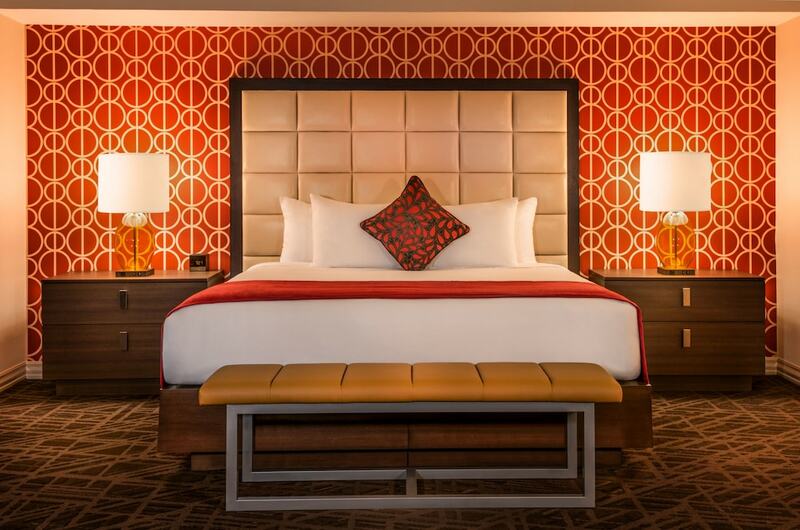 With a stay at Bally's Las Vegas - Hotel & Casino in Las Vegas (Las Vegas Strip), you'll be steps from Grand Bazaar Shops and 5 minutes by foot from Miracle Mile Shops. This 4-star resort is 0.3 mi (0.4 km) from LINQ Promenade and 0.7 mi (1.1 km) from High Roller. Make yourself at home in one of the 2814 air-conditioned rooms featuring refrigerators. Your room comes with a pillowtop bed. Complimentary wireless Internet access keeps you connected, and satellite programming is available for your entertainment. Private bathrooms with showers feature designer toiletries and hair dryers. Relax at the full-service spa, where you can enjoy massages, body treatments, and facials. After enjoying recreational amenities such as a nightclub and a health club, a lucky night at the casino is the perfect end to the day. Additional amenities at this resort include concierge services, an arcade/game room, and gift shops/newsstands. Enjoy American cuisine at BLT Steak, one of the resort's 15 restaurants, or stay in and take advantage of the room service (during limited hours). Snacks are also available at the coffee shop/café. Relax with your favorite drink at the bar/lounge or the poolside bar. Full breakfasts are available daily from 4 AM to noon for a fee. Featured amenities include a business center, limo/town car service, and express check-in. Event facilities at this resort consist of a conference center and a meeting room. Self parking (subject to charges) is available onsite. This Las Vegas hotel's amenities include a health spa offering numerous relaxation options, including multiple spa tubs, saunas, steam rooms, hydrotherapy treatments, and body wraps (surcharges apply). The hotel pool is open 7 days a week, March–October, weather permitting. Hours vary by month, but the pool is generally open from morning through the afternoon. Cabanas are available for rent. The Grand Bazaar Shops is a 2-level, outdoor promenade with more 120 shops, including luxury and international brands. Appetites are appeased in the traditional steak house, buffet venue, and Italian, Asian, Mexican, and Japanese restaurants. Bally's Las Vegas - Hotel & Casino also serves a lavish Sunday brunch. A concierge desk and staffed business center are on site (surcharges may apply). WiFi for 2 devices is included in the resort fee. Self parking and valet parking are available for a surcharge. BLT Steak - an interpretation of the American Steakhouse with traditional fare and a bistro ambiance. Now open after the success of BLT Steak's locations in nationwide hot spots, Bally's Las Vegas - Hotel & Casino and ESquared Hospitality are introducing the concept to the Las Vegas market. BLT Steak infuses a trendy, contemporary energy into the center-Strip action at Bally's. A curving bar and lounge greets guests as they enter the main dining room. The 9,300 square foot space is splashed with rich woods and a back drop of warm neutral tones accented with polished stainless steel, amber and tangerine. A fireplace serves as the centerpiece of the dining room and evokes an aura of relaxed but contemporary elegance. Nathan's Famous - from a single restaurant in Brooklyn nearly 100 years ago, Nathan’s Famous has become the mouth-watering first name in hot dogs. Find out why in their Bally’s Las Vegas - Hotel & Casino restaurant, a perfect spot for quick bites morning noon and night. A full breakfast menu is served along with Nathan’s Famous all-beef hot dogs and burgers, chicken sandwiches and crinkle-cut French fries. Top them with chili and cheese, sauerkraut and mustard or whatever you’d like. This Bally’s Las Vegas restaurant is located on the lower level, in the food court. SEA: The Thai Experience - SEA: The Thai Experience has joined the culinary lineup at Bally’s Las Vegas - Hotel & Casino, bringing its unique fusion cuisine to the world of Thai restaurants in Las Vegas. SEA Thai Restaurant is open for lunch, dinner and late-night bites. SEA: The Thai Experience at Bally’s Las Vegas - Hotel & Casino offers guests a fresh, exotic destination where they can enjoy the flavorful taste of Thai food and the aroma of Asian spices within the ambiance of the Bangkok-inspired modern design. The diverse menu offers guests a variety of specialty Thai and Vietnamese dishes including grilled lemongrass chicken, tamarind whole fish, classic pork chop, volcanic chicken and pineapple curry duck. Buca Café Italiano - Traditional Italian cuisine for all meals (breakfast, lunch, and dinner). Meals served alongside a daily carving buffet. Tequila Taqueria - Casual and fun Mexican restaurant and tequila bar with 37 premium tequilas, 10 Mexican beers and many traditional Mexican dishes. Open 7 days a week from 12 PM to 6 AM. LavAzza - Coffee house. Pastries, coffee drinks, juices, smoothies. Open 24 hours daily. Cafe Sbarro - Thin- and stuffed-crust pizzas, other Italian fare. Open from mid-morning to late evening daily in the hotel's food court. Subway - Sandwiches, salads, and other sub shop fare, served in the hotel's food court. Nosh - Snack bar. Bagels, croissant sandwiches, hot dogs, salads, freshly made desserts. Open from early morning to late evening daily. The Terrace Cafe - Poolside café. Burgers, hot dogs, deli sandwiches, snacks, beverages. Seasonal hours. "Masters of Illusion"- Starring the world’s greatest award-winning magicians, this 21st century magic show is unlike anything audiences will have seen before. Masters of Illusion’s limited engagement is a production for the whole family, featuring modern illusions and unbelievable arts of deception. "Paranormal - The Mind Reading Magic Show"- Experience an afternoon of mystery, magic, hypnosis and mind-reading that will leave you astonished and amazed. "Solid Gold Soul"- Solid Gold Soul, the Magic of Motown, features the top headliners of soul impersonators in the world from James Brown, The Four Tops, to Stevie Wonder, Diana Ross, the Supremes and many more. Blue seating, ceilings, and lighting create a distinctive ambiance at Drai's Indigo Lounge, which presents musical acts ranging from cool jazz to rock and roll, and serves signature cocktails and coffee drinks. Comprising 67,000 square feet (6,225 square meters), the Casino includes a poker room, Caribbean poker, three-card poker, video poker, and Pai Gow poker, in addition to blackjack, craps, roulette, slot machines, and a 250-seat sports book and race book. Total Rewards offers complimentary membership cards that consolidate in single accounts slot and gaming-table play at six casinos: Bally's Las Vegas - Hotel & Casino, Paris Las Vegas, Caesars Palace, Rio, Harrah's, and Flamingo Las Vegas. Members earn cash and/or rewards redeemable for food, drink, and hotel services and facilities. Members also receive 10-percent discounts at gift shops owned by the hotels and may charge expenditures at all five hotels to their rooms. Bally's Las Vegas - Hotel & Casino offers a 30-person spa tub in a tropical garden adjacent to the large pool, as well as rental cabanas and a seasonal poolside bar. The full-service spa at this Las Vegas hotel is equipped multiple spa tubs, sauna and steam rooms, and massage treatments (surcharges apply). Eight lighted tennis courts are on site, and tennis pros are available for private or group instruction (surcharges). Numerous golf courses are available in the Las Vegas area. The property has connecting/adjoining rooms, which are subject to availability and can be requested by contacting the property using the number on the booking confirmation. Free in-room WiFi has a 2-device limit.